Well, this is just a very impressive comic, that’s all. It’s a fun romp with a bunch of tween girls who are in search of some big adventure while at summer camp. And they prefer their adventure at night in the woods, much to the consternation of Jen, the camp intern. But more to the amusement of Rosie, the camp director. Created by Shannon Watters, Grace Ellis and Noelle Stevenson, written by Ellis and Stevenson, and illustrated by Brooke Allen, “Lumberjanes” is brought to you by Boom! Box, an imprint of Boom! Studios. 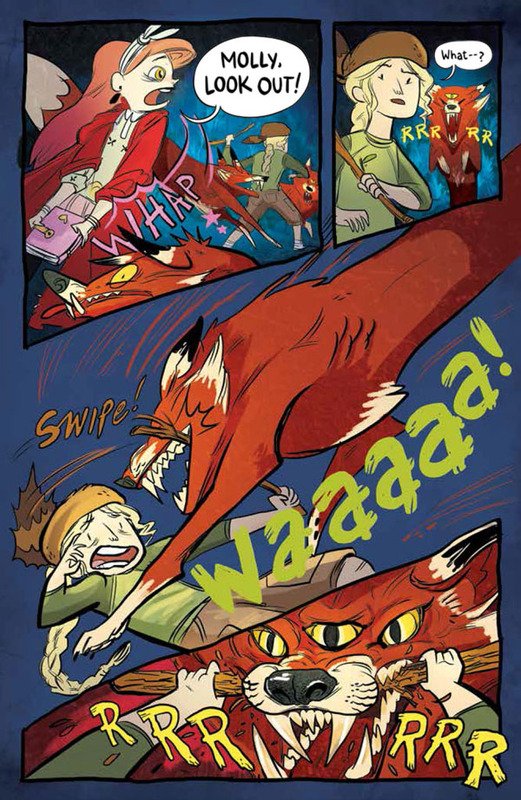 In this first issue, we are given a big dose of whimsy and action. You may feel a bit of character and information overload at first but that soon clears up as you settle into the story. Either these girls have very powerful imaginations or they are in a heap of trouble up ahead. It’s just too early to say switch. Heck, we may never know. All we can know for sure is that this is very funny stuff. I especially like the way Allen’s artwork is not afraid to let loose and be jittery when it needs to or have compositions that slice right through the page. This is a very challenging time for these girls. They are all just around the corner from some big changes. And I’m not referring to menacing monster bears or a ferocious pack of foxes. These girls are tweens. You can figure it out. “Lumberjanes #1” is available now. Visit our friends at Boom! Studios right here. I really dig their art style in this. So good. Yeah, this is good stuff. It confidently follows its own logic and sense of humor.